Picture of an Islamic "conversion" of an eleven year old British boy. A warning we should heed. This is the shocking picture of a young, white schoolboy being converted to Islam by a cleric linked to a radical Muslim hate preacher. The bewildered 11-year-old, who gives his name as Sean was filmed repeating Arabic chants and swearing allegiance to Allah. The boy is prompted throughout by controversial cleric Anjem Choudary, a follower of exiled hate-preacher Omar Bakri Mohammed. The incident was filmed during a demonstration by Choudary's Ahlus Sunnah Wal Jama'ah group in Birmingham city centre earlier this month. 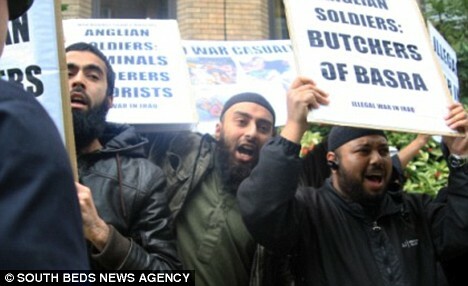 Choudary, 42, was one of the masterminds behind the protests at the homecoming parade of heroic British soldiers in Luton earlier this year. He praised protesters who branded British troops 'murderers' and later appeared at a press conference flanked by thugs who took part in the demo. 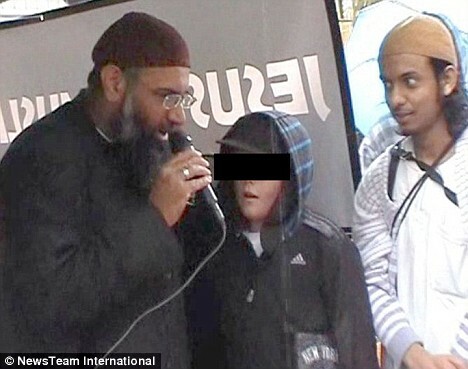 Choudary defended the young boy's 'reversion' to Islam but admitted his parents were not with him and were not consulted. 'The boy told us he wanted to become a Muslim and, of course, some people are intellectually more mature than they are physically. I don't see there is any harm in this. 'He was with his friends, but I didn't see if his parents were there,' he added. A message on Choudary's website offers advice for those who become Muslim at his Islamic Roadshow. 'Conversion packs are already provided to those who revert to Islam in the Islamic Roadshows,' it says. Ahlus Sunnah Wal Jama'ah, is a splinter group of the controversial Al Muhajiroun sect. Al-Muhajiroun, which has recruited hundreds of fanatics in the Midlands, fell apart in 2004 just months before Bakri was stopped from coming back to the UK under terror laws. It has been revealed that the sect is planning to reform. Bakri has now set his sights set on a return for the extremist group, though the Home Office is understood to be closely monitoring its activities.